I combine my athletic and artistic practices by drawing something I see on each run, in the same amount of time as the run. This ongoing art series is a visual journal of my training—and my love letter to New York City. As a children's author-illustrator, I spend a lot of time drawing. After working on three books in one year, my brain needed some serious creative cross-training. One evening while on a run over the Manhattan Bridge, I saw a gorgeous sunset. I snapped a photo with the intention of painting the scene as a watercolor landscape, just for fun. As I continued running, I looked down at my watch and had a moment of inspiration. I thought, I can paint this sunset, but then it will just be a sunset. But if I paint the sunset in the same amount of time as this run, then the two things become connected. And my project was born. Inspired to run and draw? Book a ‘View From My Run’ fun run with me! “Lori taught us to take our thoughts to what we see, not how many miles we have left.” —Maria N.
Calling all creatively-curious running clubs! Lace up and hit the road with me for an inspiring 2-mile-ish outdoor fun run followed by a mini art class. We'll warm up with a brief talk about the View From My Run project and talk about how running parallels art-making. Then we'll hit the pavement and pause midway through the run for a brief photo-taking break. Post-run, we'll return to a comfortable indoor or outdoor location and cool down with a relaxed, casual mini-art class where runners will create a timed drawing based on a photo of their choice. 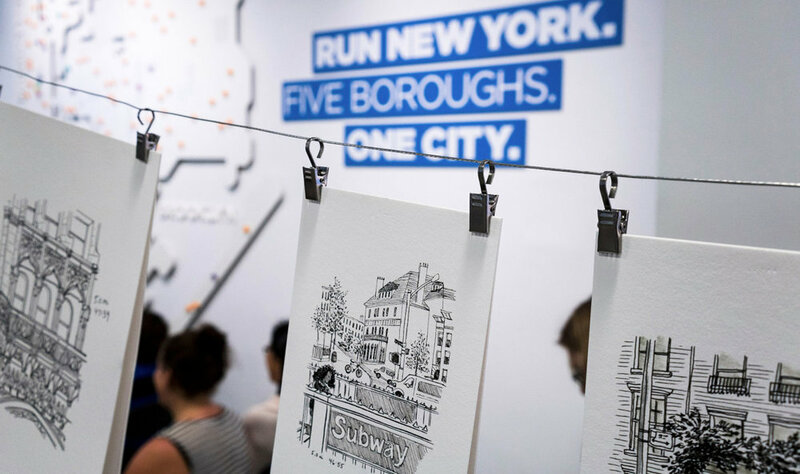 I will show printed samples of my View From My Run art and coach runners with tips and tricks as they make their own beautiful keepsake of the run. No art experience necessary! All art supplies will be provided. Runners should expect an easy 10:00+ pace and should bring a smartphone to take photos. I'm not sure... I just do it. I don't make pencil sketches before I ink, I don't erase, and I don't start over when I make a mistake. Like in running, I push through and keep going. I work around it. The series is not about being precious or perfect, it's about documenting the run! I draw in a tiny corner of our kitchen table! Weirdly, I find it relaxing! Knowing I have limited time means I don't think about it too much, and I feel free to make the marks as they come. It's fun and loose. When the timer goes off, I stop. No, but I've heard plenty of jokes about strapping an easel to my back. Sign up for my newsletter below for View From My Run updates and more. Happy drawing and running!